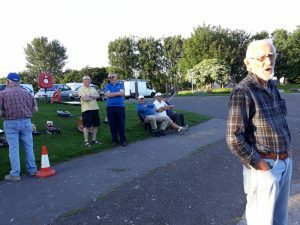 It was a nice sunny spring evening for the first round of the 2019 scale challenge series which kicks off the Wednesday evening events. Five members turned up, 4 competitors who had 3 boats between them. The scheduled event was the range test, a quick and simple course to put out, as the evenings are still quite short. Even though we had only 4 competitors after two goes each, we only just got done before the sun set. The final night of the scale challenge was to be straight running. this Turned out to be quite fortunate as shortly after the course had been set out and the first few competitors had done their first run, the heavens opened for about half an hour or so. The rain was torrential, we haven’t seen rain like that for months! Nine members were present, Arley Bushill took the honours in the first round with a nearly perfect 13, however Chris Locke took the second round with a perfect 14 score. Russ Chilcott takes the overall series followed by Chris in 2nd and myself (Rob Arlett) in 3rd place. This was the second payload challenge event of the year. This was not as eventful as the first with all boats starting and four boats lasting the hour. Russ, Chris, Steve and Rob B were the four boats to go the distance out of the eight competitors that took part. The honour of the night went to Russell who completed 52 laps, two ahead of Chris. We then heard about it all night! 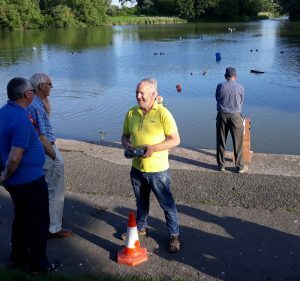 It was another hot and sunny evening at the lake for the scale steering event. It was decided that as it was a nice evening and high summer so all 10 obstacles would be put out along with Malcolm’s Dog House. The course was then drawn and posted on the lake side board for easy viewing. 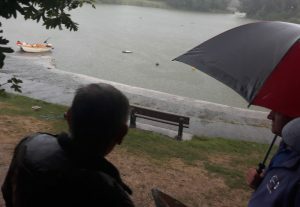 10 members were present for the event one had to borrow a boat and Malcolm used mine as his tug boat developed a lake side fault, he did not get on to well with the boat. Each competitor went around the course twice with the members not on the course taking it in turns to score. Round four of the scale challenge series was the blind steering event, which always gives great amusement and laughter could be heard echoing around Apex Lake. 12 members participated giving 6 teams. Thanks must go to Dave Lowther for standing for Rod Butler who was expected at the lake but was kept late at work. The teams were selected by an App on Russell’s phone. Myself and Russell done a quick test of the circuit and done it in about 3 minutes, so we thought that was fine. 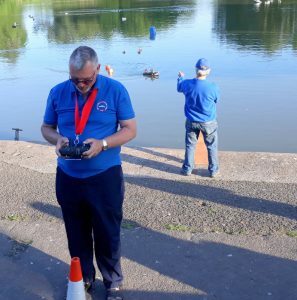 So the first team of Arley and Chris took to the water, with Arley calling, it did not take long for the usual mixing up of left and right to take hold. Both caller and controller getting it wrong giving good entertainment to the onlookers. Nearly 13 minutes later they finished, so much for the 3 minutes! Things did not get any better with the second team of Kevin and Bob Bryant who had to be sadly stopped after 15 minutes on the third obstacle, or we would still be there now. The remaining teams did complete the first round in more reasonable times (see results). The second round saw the callers and controllers swap around, the completion times were a lot more reasonable, the entertainer of this round was Malcolm who could just not get his left and right correct, so did take a while to get through the first obstacle. 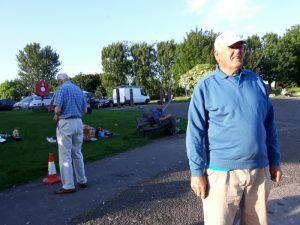 This evening was very enjoyable for club members and the watching public. The honour of the night went to Steve Coles and myself. The evening for the 1st of the payload challenge endure event saw a nice sunny evening with a variable light breeze. There were six entrants with Arley arriving early to try out his just finished challenge boat. The honours of the night went to Chris locke, finishing only slightly ahead of Bob Bryant. Steve Coles finished 3rd, with the first 3 going the full one hour, Malcolm’s boat finished 4th expiring 10 minutes from the end. Sadly for Arley his boat did not start, a bit too finely engineered, still 9 weeks to get it sorted and perfected for the next event. Russell had the usual pre event gibberish and as a result ended up providing the comedy of the night. His boat provided to be a little temperamental through out the event, with Russell jumping in and out of the rescue boat to retrieve his boat. His boat managed 9 laps and finished 5th and last. Russell complete about two laps in the rescue boat, no points for that! It was a good turn out for the 2nd round of the scale challenge competition, weather was fair with quite a strong cool breeze. This round was a predicted log event. The honours of the night went to Kevin Roberts closely followed by Keith and Arley. Fourteen boaters participated with several others there to free sail and spectate. Round 1 of the Scale Challenge was a Range Test. This involves driving through a set of buoys at some distance away. There were some good scores all round and eleven entries meant a few extra penalty points resulted in a drop of several places. Russ and Mike tied for first place with 39 points and Malcolm is in third place on 32 points.